Ten years after the release of the last Star Wars film, which was the Star Wars Episode III: Revenge of the Sith, the latest edition of this award-winning and iconic movie franchise features yet again a scene that is as well-loved as the heroes of the saga—pod racing. 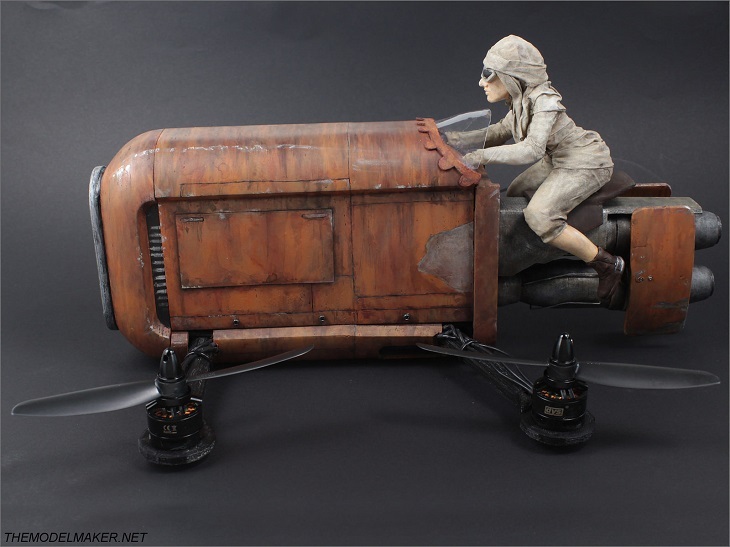 For Star Wars fans, pod racing cuts a very critical role in the entire storyline as this is the event that led to the freedom of one Anakin Skywalker, who will eventually become Darth Vader, who is without doubt one of the most popular figures in all of the movie world. There is no question that fans of all ages have often found themselves dreaming of hurtling through dangers aboard their own speed racers. Decades ago, this would have remained just that, a dream. However, with the latest breakthroughs in 3D printing technology, the new generation finally has the means of bringing to life one of the most coveted pieces of technology that can be found in the Galactic Empire. If there is anyone that can truly claim to be a die hard fan of Star Wars without blushing, it has to be Michael Miszta. After several failed attempts at creating a quadcopter, he finally got his efforts right in time for the release of the biggest thing to hit the movies this year, which is the Star Wars: The Force Awakens. 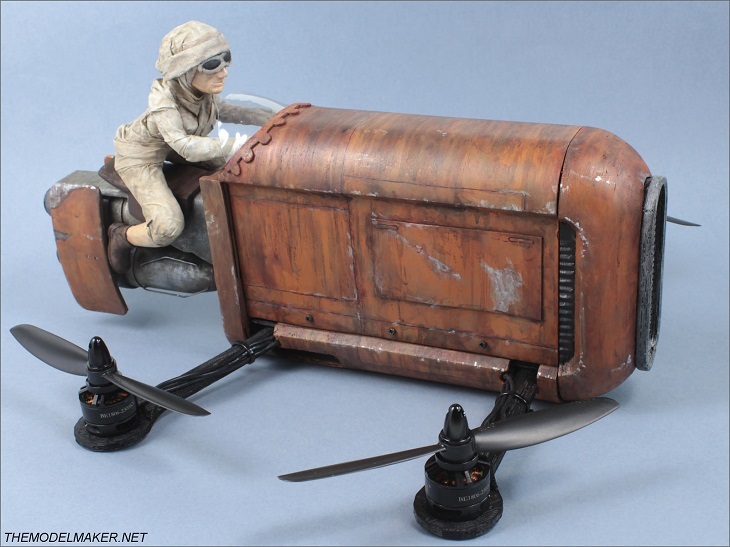 3D printing technology’s prime feature of allowing designers to tinker endlessly with their designs allowed Michael to reproduce a miniaturized version of Rey’s Speeder. Michael enthuses that because of 3D printing, he now has the ability to customize his parts to make the quadcopter work as designed. As the main foundation of his framework, he uses the durable and highly-coveted ZMR250 carbon fiber. Knowing that this his quadcopter could crash, durability has to be given premium importance. Despite his durability concerns, 3D printing allowed him to limit the weight to around 500g. Using Google SketchUp, he was able to improve on his past designs and ideas. On top of his existing designs, the internet also provided him with endless photos to work with. From there, the carefully designed parts were 3D printed in his home. Once all the parts were 3D-printed while the main frame received painstaking sanding and painting, the result was a quadcopter that can really dazzle the eyes of even the most casual Star Wars fan. 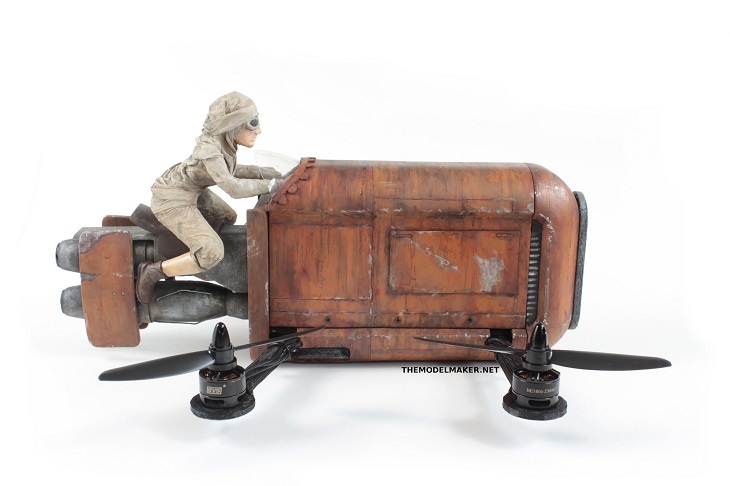 To make the character Rey as real as possible without adding even more weight to the quadcopter, Michael used Styrofoam and a bit of clothing. This version might not fly as fast as his previous models, but this looks better and is certainly more durable. As far as motors and electronics are concerned, interested fans can practically use anything they want. That being said, Michael sees a 350W output coupled with 6-inch rotors as the ideal tools to make the quadcopter work as intended. Luckily for Star Wars fans, the designs are all available for downloading at Thingiverse. Michael’s quadcopter may just be a miniature version, but who knows if The Force and 3D printing’s unending developments may soon allow designers to build a real-life Speed Racer.